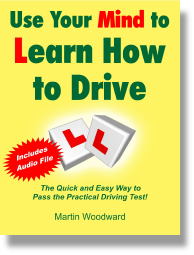 This new incredible book (or eBook) and Audio mp3 recording which costs far less than a single lesson will save you ££££’s on unnecessary driving lessons. Written by a retired top grade (6) instructor with over 45 years experience who was the proprietor of one of South Yorkshire’s most successful driving schools. YOU WILL BE IMPRESSED BY THIS TOTALLY UNIQUE PRODUCT! Why some people learn really easily. Negative influences from friends/family and previous tests etc. After studying the information you will agree that although it might seem a little ‘unconventional’ at first, it is in fact perfectly logical AND IT WORKS! Note also that as the main part of this guide and technique is about practical driving, it is are also applicable for use in any country in the world.